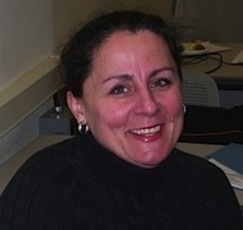 Mary McAleer Balkun, editor of the Society of Early Americanists Newsletter, is Professor of English at Seton Hall University. She is author of The American Counterfeit: Authenticity and Identity in American Literature and Culture and Associate Editor of The Greenwood Encyclopedia of American Poets and Poetry. Her other publications include articles on Phillis Wheatley, Sarah Kemble Knight, and teaching with technology. Her current project is a study of the early American grotesque. The SEA Newsletter features informative material such as letters from SEA officers, announcements about conferences and other professional opportunities, interviews with scholars and editors, and abstracts from SEA-sponsored conference panels. 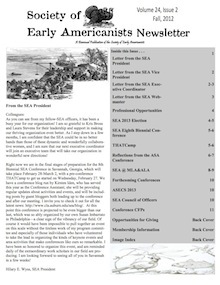 The Newsletter is issued to current SEA members twice yearly, Spring and Fall. To receive the SEA Newsletter and to become a member, please visit the Membership page. 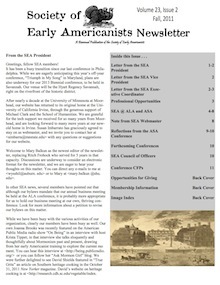 For a sample Archive of the Society of Early Americanists Newsletter, Fall 2011- Fall 2016, please click here. 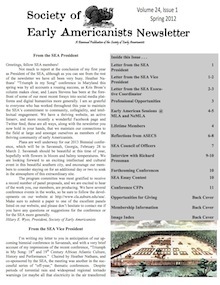 For a brief history of the Society of Early Americanists Newsletter, please click here.